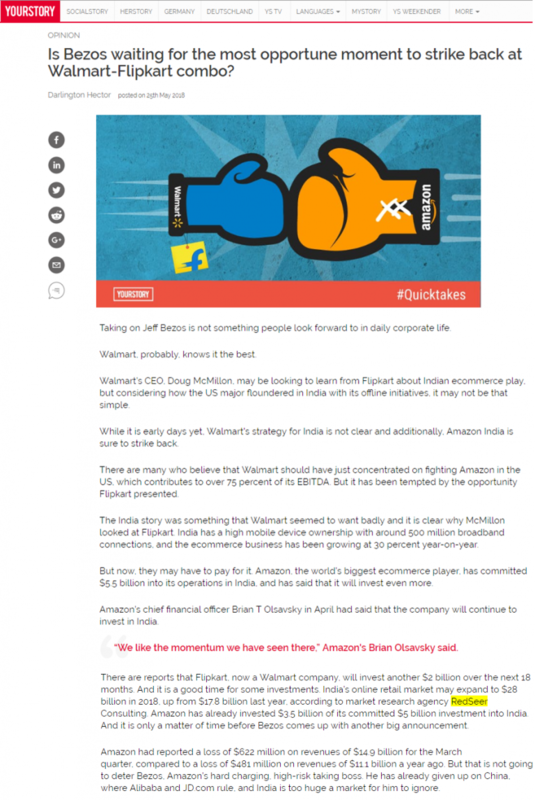 YOURSTORY: Is Bezos waiting for the most opportune moment to strike back at Walmart-Flipkart combo? YOURSTORY: Taking on Jeff Bezos is not something people look forward to in daily corporate life. Walmart, probably, knows it the best. Walmart’s CEO, Doug McMillon, may be looking to learn from Flipkart about Indian ecommerce play, but considering how the US major floundered in India with its offline initiatives, it may not be that simple. While it is early days yet, Walmart’s strategy for India is not clear and additionally, Amazon India is sure to strike back. There are many who believe that Walmart should have just concentrated on fighting Amazon in the US, which contributes to over 75 percent of its EBITDA. But it has been tempted by the opportunity Flipkart presented. The India story was something that Walmart seemed to want badly and it is clear why McMillon looked at Flipkart. India has a high mobile device ownership with around 500 million broadband connections, and the ecommerce business has been growing at 30 percent year-on-year. But now, they may have to pay for it. Amazon, the world’s biggest ecommerce player, has committed $5.5 billion into its operations in India, and has said that it will invest even more. Amazon’s chief financial officer Brian T Olsavsky in April had said that the company will continue to invest in India. “We like the momentum we have seen there,” Amazon’s Brian Olsavsky said. There are reports that Flipkart, now a Walmart company, will invest another $2 billion over the next 18 months. And it is a good time for some investments. India’s online retail market may expand to $28 billion in 2018, up from $17.8 billion last year, according to market research agency RedSeer Consulting. Amazon has already invested $3.5 billion of its committed $5 billion investment into India. And it is only a matter of time before Bezos comes up with another big announcement.